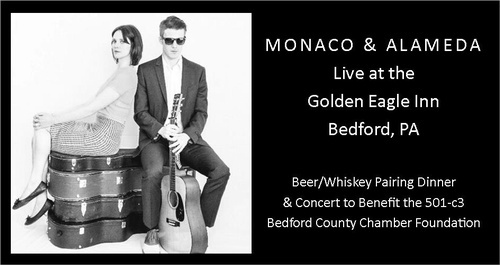 One Night Only: join the acclaimed folk duo, Monaco & Alameda for an evening of lively music, delicious food, and wonderful company to benefit the educational programs of the 501-c3 Bedford County Chamber Foundation. With only 55 available tickets, this intimate evening will feature Erika and Peter Sheridan, who Foundation patrons will recognize as the part of the band, Byrne and Kelly, who visited Bedford in 2018. Concert guests will enjoy a 3-course Irish-American fusion dinner, with each course paired with Irish and American spirits and local beer from the Olde Bedford Brewing Company. Special overnight rates at the Golden Eagle Inn will be available. The Bedford County Chamber Foundation is the 501-c3 educational organization administrated by the Chamber of Commerce which provides unique educational opportunities for students and adults of the Bedford County region. These programs include: Leadership Bedford County, Youth Leadership and the annual YLBC Summit, BASICS, Steps to Success, Educator in the Workplace, Entrepreneur and Literacy Initiatives, including Community Reading Day and much more. Chamber Foundation programs benefit thousands of Bedford County students each year; the Foundation is eligible to receive ETIC funds. $25 Optional Add-On: Commemorative bottle of Keep Your Powder Dry Irish Stout - available as part of a Heaven Hills Bourbon Barrel Release at Olde Bedford Brewing Company with autographed postcard. Sponsorships are now available by calling the Chamber office.